A book is resting on a board. One end of the board is slowly raised. The book starts to slide when the incline angle is 15°. 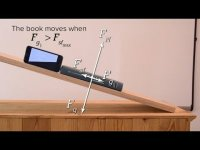 What is the coefficient of static friction between the book and the incline? Want Lecture Notes? This is an AP Physics 1 Topic.